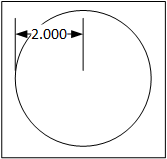 Circumference is the linear distance around a circle. This value is critical to know when finding the resolution of a measuring wheel, or when working with belts and pulleys. Circumference is equal to the diameter of the circle (or twice the radius) multiplied by pi (π). 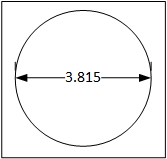 An encoder measuring wheel has a diameter of 3.815″. Most measuring wheels are produced to this diameter, because when multiplied by pi, their circumference comes out to almost exactly 1′. A pulley on a belt-driven actuator has a radius of 2″.